Mixed seafood risotto is not something I would order at a restaurant. This is because you never know the quality of seafood they will put into the dish. I know the type of friend I am, kind, loyal and helpful. Sometimes my willingness to assist people has ended up as being a negative but mostly I love being there for my friends. But, sometimes I have to just step back or walk away. I have a friend who only ever sends me an SMS when she needs information. I have another friend who will call me at any hour of the day or night, if she needs my opinion – which she never listens to. Then I have a friend who makes plans with me and cancels 5 minutes before we are meant to meet. I have friends who never pop in to visit yet expect to see me once a week! I also have friends who are caring and loving and for whom I would go to the end of the earth for. It is these friendships that make being who I am so worthwhile. In the generosity of friendship many a meal has been shared. Each one tells its own story – some good and some not so good. Each memory can be savoured like a taste of the perfect dish. This meal is inspired by friendships, no matter the nature of them. 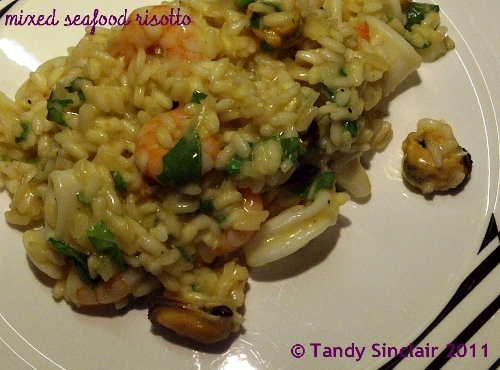 It is my love for anything Italian that made me join Presto Pasta Nights – and the friends I have made through this community of like minded people are worth knowing, and not only for their comfort meals of pasta 🙂 This risotto recipe does not quite fill the bill, being rice and not pasta but it is Italian! I forgot to check the battery of my camera and so this photo was taken with my blackberry! I am submitting this recipe to Presto Pasta Nights, which is being hosted this week by Ruth from Once Upon A Feast, the founder of PPN. Heavenly dish – so glad I can count on being a friend… especially since you are such a great cook! Thanks for sharing the dish & the sentiment with Presto Pasta Nights. Sounds so yummy, Tandy. What is drunken pecorino? Even if not photographed with your camera, your risotto looks good and must be excellent. It looks just perfect, I hope I am a good friend to you as you are to me! Some friendships are hard work Tandy! This delicious risotto would hit the spot with a glass of Chardonnay. That looks like a perfectly cooked risotto – just how I like it!